Mid-sized and folds in half so you can take it with you. Optional Travel Bag makes transporting a cinch. Included is a weighted home plate and one ball kit. Our best seller. Full featured, full size, heavyweight for the power stroker. 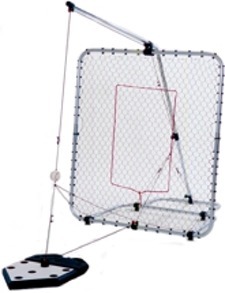 Included is a weighted home plate and two ball kits. Currently in use by 26 Big League Baseball Teams and numerous Colleges/Universities.